Kaleida Health's philosophy of nursing builds upon the organization's mission and vision and values as well as the concepts of Jean Watson's patient care model. 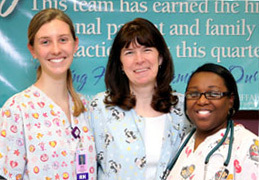 Our nurses are committed to patient and family-centeredness, quality of care, respect, social responsibility, fiscal responsibility, professional development and professional collaboration in provision of care along a continuum from conception through end of life. Nursing is committed to excellence and lifelong learning that integrates evidence-based practice, research and professional development. Kaleida Health believes in treating patients as whole beings - body, mind and spirit. We are sensitive to others by nurturing their beliefs. Each person is entitled to self determination, including the right to make decisions about his/her own health care. Kaleida Health recognizes that health is an ever-changing process influenced by an individual's age and stage of development, personal well-being and the presence or absence of disease. Our nurses must assume a leadership role to promote and enhance a culture of patient safety and healing. Nurses provide relationship-based care inclusive of family and significant others as well as the patient. We believe in creating a work climate for nurses that supports clinical expertise, education, shared governance and research. We foster the recruitment and retention of nursing staff who demonstrate the highest integrity, competence and qualifications and encourage nurses to lead from the bedside. "Maybe this one moment with this one person is the very reason we're here on Earth at this time."